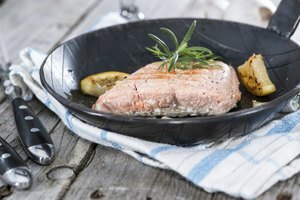 Broiling under high heat is a quick method to cook many foods, including salmon. 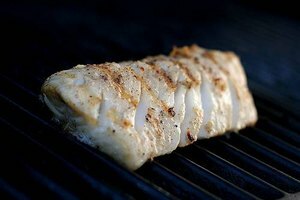 Choose fillets, which cook quickly, and pay close attention while cooking to avoid burning or charring your fish. Season the salmon before or after broiling using dried or fresh spices, glazes or marinades. What's more, you can broil salmon fresh or while it's still frozen. Very fresh salmon requires only minimal seasoning before broiling. Rub the fish with a cooking oil, such as olive oil, and sprinkle with salt and pepper for a simple preparation. 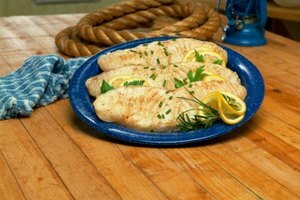 Squeeze fresh lemon on the fish just before cooking to create a sharp contrast to salmon's rich taste. Brush glazes, such as teriyaki or sweet chili sauce, onto fillets just before cooking, or marinate salmon prior to cooking. Apply a mix of dry, powdered spices or marinate in a wet marinade, such as a mix of white wine, garlic, rosemary and olive oil. 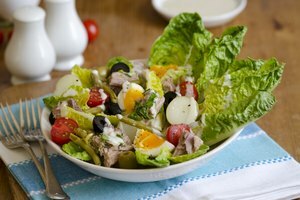 Preheat the broiler to a high temperature, usually 425 degrees Fahrenheit or higher. Place the salmon skin side down on a broiling tray or on a baking sheet, and position the oven rack to between 2 and 5 inches from the heat source. If you are seasoning your salmon with more than just oil and salt -- such as herbs or a glaze -- keep the fish further from the heat source -- 3 1/2 inches or more -- to prevent burning. The high sugar content of some glazes means the salmon will brown faster under the heat of the broiler, so watch carefully it while cooking. For a crisper exterior, place salmon closer to the broiler. When salmon is fully cooked, it appears opaque and flakes easily with a fork, but even overcooked salmon tends to stay moist. To test for doneness, look for browning on the top of the salmon and a little whiteness at the edge of the fillet or chunk, which indicates cooked fat. When pressed with the back of a wooden spoon or your finger, the salmon should only give slightly. A 1 1/2-inch thick fillet broiled at 450 F and placed 4 inches from the broiler will be cooked to medium rare in roughly 12 minutes. Boneless cuts of salmon, such as fillets or salmon chunks, take better to broiling, because bones take longer to cook. 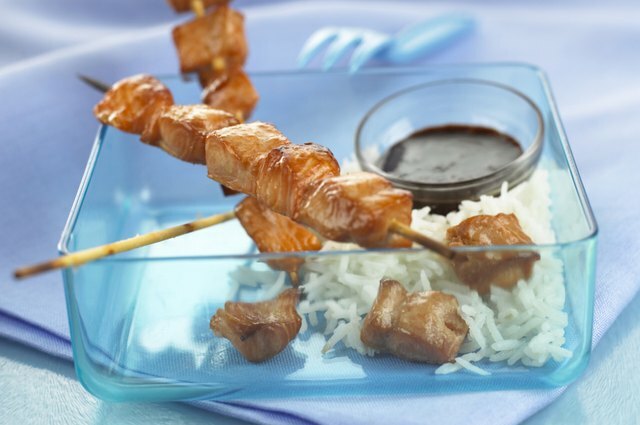 Place individual salmon fillets under the broiler or skewer smaller pieces of salmon -- at least 2 inches square so they don't easily fall off -- to make kebabs. Keep the skin on fillets to keep them from sticking to the cooking tray. For kabobs or skinless fillets, grease the tray well before cooking.